Lawrence D’Angelo, MD, MPH was recently recognized by the American Health Council for “Best in Medicine” for his outstanding contributions to the medical field. Throughout most of his impressive 36-year career, Dr. D’Angelo served as the Chief of the Division of Adolescent and Young Adult Medicine at Children’s National Health System (CNHS) in Washington, D.C. He has been dedicated to improving the health and well-being of adolescents and young adults by providing care for patients and training and education in adolescent medicine and adolescent HIV for countless trainees. Dr. D’Angelo’s academic career began Harvard University, where he earned a bachelor’s degree in 1969. He later enrolled at Harvard T.H. Chan School of Public Health, and earned a master’s degree in public health from the institution in 1972. The following year, he earned a medical degree from Duke University. As a result of his academic excellence, he became a member of the Alpha Omega Alpha at Duke and Delta Omega Epsilon for his public health contributions. He completed a residency at Georgetown University Medical Center in Washington, D.C., and a second residency in preventive medicine at the Centers for Disease Control and Prevention in 1979. That same year, he accepted an attending physician position at Georgetown University Medical Center and remained there until 1982. In mid-1982, Dr. D’Angelo was named the Chief of the Division of Adolescent and Young Adult Medicine role at CNHS and has remained there since. At CNHS, over time Dr. D’Angelo’s responsibilities included patient care, research, advocacy and administration. He founded the Burgess Clinic for HIV infected youth and most recently created the Youth Pride Clinic for LGBTQ youth. He has published over 200 peer reviewed articles and abstracts spanning a variety of topics in adolescent health but focused mainly on HIV infection in youth. 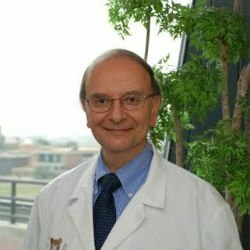 In addition to his duties at CNHS, Dr. D’Angelo also serves as a tenured professor of Medicine, Health Care Sciences, Prevention and Community Health, and Epidemiology at the George Washington University. His professional repertoire includes serving on the Sexual Information and Education Council of the U.S. board of directors, founding and serving as president and board member of Metro Teen AIDS and serving as a former council member and president of Medical Alumni Council at Duke University Medical Center and being President of the Society of Adolescent Health and Medicine. Dr. D’Angelo’s efforts to improve the lives of his patients earned him to place on the Top Doctor of Northern Virginia Magazine list in 2016 and 2017. He was also most recently honored by the Society of Adolescent Health and Medicine with its most prestigious award, the Outstanding Achievement in Adolescent Health and Medicine Award earlier this year for his dedication to the field of Adolescent Health. Dr. D’Angelo plans to continue his career in a senior clinician role and by providing ongoing education for students, residents and fellows. At Children’s National, physicians and nurses provide compassionate, professional care to thousands of patients every year. The hospital services patients from all over the United States and from more than 20 countries around the world. Children’s National is proud to be named number one for newborn intensive care in the U.S. News & World Report Best Children’s Hospitals survey and ranked among the Top 10 children’s hospitals overall.